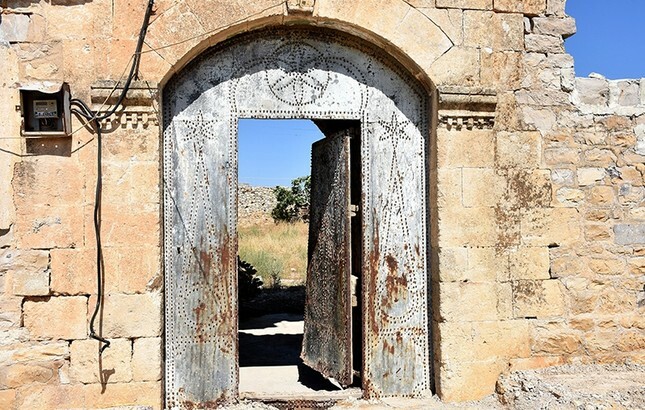 A military headquarters used by Mustafa Kemal Atatürk in World War I was discovered after the Turkish military liberated Syria's Afrin province from the PKK-linked People's Protection Units (YPG) terrorist group, according to officials. In an interview with Anadolu Agency, Hatay Mustafa Kemal University history department professor Süleyman Hatipoğlu said that the mansion, located near the train station in Haj Khalil village of the town of Raju, was converted into a headquarters and used by Major Gen. Mustafa Kemal when he was the commander of the Seventh Army in World War I. Following successful command duties in the Battle of Gallipoli and the Eastern Front, Mustafa Kemal was stationed in Syria during the late stages of World War I when the Ottoman Empire, which allied with the Central Powers, was struggling to control the Arab regions as the British Empire spread propaganda to provoke an Arab revolt. The anticipated revolt led by Sharif Hussein bin Ali of Mecca broke out in 1916, targeting Ottoman troops and logistics lines in Hejaz and Jordan. British troops led by General Edmund Allenby, defeating Ottoman forces previously in Gaza and Jordan, won an overwhelming victory against Ottoman troops led by German General Liman von Sanders in the Battle of Megiddo in Sep. 1918, leading to the loss of Palestine and Damascus and the collapse of three Ottoman armies known as the Thunderbolt Army Group. Mustafa Kemal, who resigned twice from posts in the Palestine Front over disagreements with German commanders and the Ottoman High Command, was appointed to command the remaining units of the Thunderbolt Army Group. Upon British advance and attacks from local Arab militia supporting the revolt, Mustafa Kemal ordered Aleppo to be evacuated and a defense to be established in the foothills of the Anatolian Plateau, a geographical distinction also separating the Arab, Turkish and Turkmen population. The defense line started from Iskenderun on the Mediterranean, following the towns of Reyhanlı, Kırıkhan, Der Jmal and ending in Tal Rifaat. He also organized a militia from the local Kurdish and Arabic population to safeguard logistics lines from Kilis. On Oct. 26, 1918, Seventh Army forces managed to stop the British advance in Qatmah, and the rest of the defensive line proved resilient against British forces, holding until the Armistice of Mudros was signed on Oct. 30. This short period was also important in Turkey's later history since many commanders on the southern front transferred arms and ammunition to the northeast after capitulation instead of handing them to the Allies, which proved valuable later during the War of Independence. Colonel Ismet, later to be known as Atatürk's closest ally and Turkey's second president Ismet İnönü, also served as the commander of the Third Corps of the Seventh Army. According to officials, the headquarters in question is the same site Mustafa Kemal used while planning the counterattack against General Allenby's offensive. The mansion was discovered through the efforts of the Local Civilian Assembly, which was formed after Afrin town center was liberated by the Turkish military and the Free Syrian Army (FSA) units in the Operation Olive Branch on March 18, 2018. Assembly Chairman Ibrahim Khalil Ali said that they wish the old house to be restored. "We have not forgotten the region's history. The Ottoman army was here. When Atatürk came, the Kurds cooperated with the Ottomans, sabotaging the railroad connecting Maidan Ikbis with Kilis and cutting the enemy's supply lines to prevent their advance. This meaningful history should not be forgotten," Ali said. The mansion, built in 1890, is partially in ruins due to neglect.